This week we will be continuing with the story from last week: Escaping Titanic: A Young Girl’s True Story of Survival, by Marybeth Lorbiecki. We will learn about how and why the Titanic sank, and learn how the survivors were rescued by another ship, the Carpathia. The Kindergarteners and the Grade 1’s will enjoy another new “Elephant & Piggie” book by Mo Willems: Elephants Cannot Dance! This story has a great message about being yourself. This week the Intermediate classes will be discussing the historical significance of the Titanic disaster, 100 years ago. We will be reading a survivor’s account of the terrible tragedy. 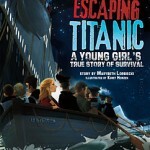 Escaping Titanic: A Young Girl’s True Story of Survival, by Marybeth Lorbiecki, tells the story of 12-year-old Ruth Becker. Since this is a longer picturebook, we will be reading it in two parts: the first part this week, and the remainder next week. There are many excellent websites about the Titanic. Click here for a list. Kindergarteners and Grade 1 students will be reading the new Robert Munsch book, It’s My Room! This is a humorous story about a boy who finally gets his own room, but relatives keep coming over to visit.